We’re really excited about the first annual Smoky Mountains Songwriters Festival held in multiple venues in Gatlinburg during August 23-25, 2012. It will be an extraordinary event, heavy on talent with high-caliber songwriters who penned many of the hits you’ll be humming again before the days are over. This is a celebration of the Appalachian roots of much of this country’s most haunting and stirring music, held in the Smoky Mountains “where bluegrass, country and old time music originated” as the festival’s founder, Cyndy Montgomery Reeves, reminds us. There will be lots of free live entertainment as well as a ticketed benefit at the Mills Auditorium in Saturday night, the 25th. Around three dozen songwriters so far are slated to appear in the festival, not just performing but also telling the stories behind their hits. You can learn the craft of songwriting at one of the four workshops being held, including how to publish your music (and get your royalties). There will also be jam sessions and a songwriting contest for all to participate. 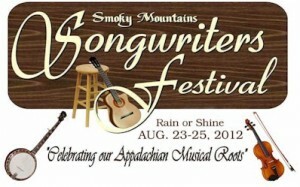 Be sure to visit the Smoky Mountains Songwriters Festival web site for lots more information. You can get the breaking stories and some great video clips at the Facebook page too.